Crouton used to have a target which allowed easy Cinnamon installation, but that's no longer available. Installing Cinnamon desktop on a Chromebook using Crouton is still possible, and this article guides you through this process. 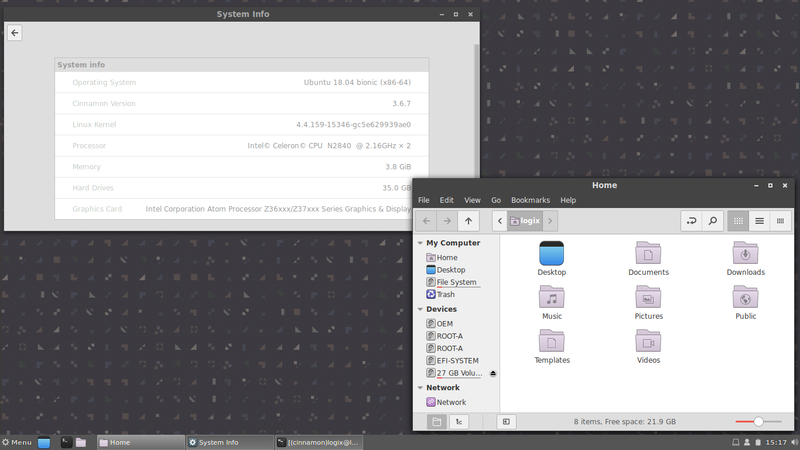 Cinnamon is a desktop environment that's derived from Gnome 3 but using a traditional desktop layout, being the main desktop environment of the Linux Mint distribution. Since Crouton doesn't support Linux Mint, Ubuntu 18.04 (Bionic Beaver) will be used as the Linux distribution on top of which we'll install Cinnamon desktop. Note: if you close tab in which you run the commands below, remember to type shell after pressing Ctrl + Alt + T or else the commands won't work (you need to type shell if the prompt looks like this: crosh>). This article assumes you've already switched your Chromebook to developer mode and you've downloaded Crouton in your Chromebook's Downloads folder. See this article for a complete guide on installing Ubuntu on a Chromebook using Crouton. 1. Install some basic Crouton targets in a new Cinnamon chroot using bionic (Ubuntu 18.04) as the Ubuntu version. You can skip the keyboard, audio and extension targets but you may need them in the future (you can add them later on though). We're using bionic because it has a more up to date Cinnamon version. It's still not the latest version though, but you could use a PPA to install an even newer version. But for this guide we'll stick to the Cinnamon version provided by Ubuntu 18.04 Bionic Beaver. The default Crouton target uses Ubuntu 16.04 (Xenial Xerus), which has Cinnamon 2.8.6, released back in 2015. It may take quite a while until Cinnamon is installed, so go grab a cup of coffee... or two. You could also install the complete Cinnamon desktop, as available in the Ubuntu 18.04 repositories (this does not work if you use a PPA), by installing the cinnamon-desktop-environment package, but that will result in a very long installation time and a lot of extra packages being installed. It's important to mention that installing dbus-x11 is very important - without it, you'll see an error when trying to start Cinnamon, which says "Could not connect to session bus: usr/bin/dbus-launch terminated abnormally without any error message". Also, the command installs XTerm because the Gnome Terminal app that's installed with Cinnamon doesn't start. So later on when you want to launch a terminal your Cinnamon desktop, launch XTerm instead of Gnome Terminal. You can also install Tilix or some other terminal emulator. 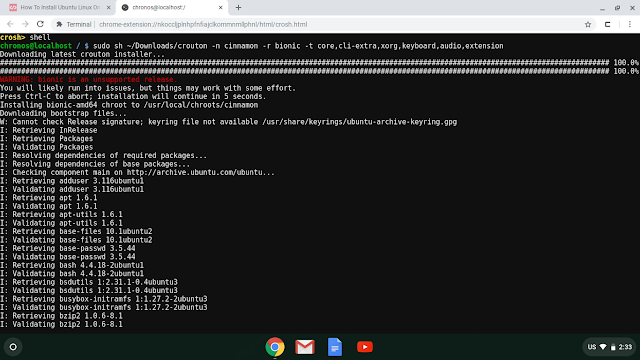 The Downloads folder is shared between Chrome OS and the chroot, that's why you can copy the startcinnamon script on Chrome OS, even though it was downloaded in the Cinnamon chroot. We've downloaded it by using the chroot so we cam use wget. The Cinnamon start instructions are based on Tenn1518's crouton-cinnamon repo. If you've closed the tab from your Chrome OS browser, open a new crosh tab by pressing Ctrl + Alt + T, type shell, followed by sudo startcinnamon on a new line. This is how you'll start Cinnamon from now on. Switch between Chrome OS and Cinnamon by using Ctrl + Alt + Shift + Back and Ctrl + Alt + Shift + Forward. This way you switch between Ubuntu / Cinnamon and Chrome OS without exiting Ubuntu. To exit Cinnamon / Ubuntu, log out from the menu present on the Cinnamon panel. 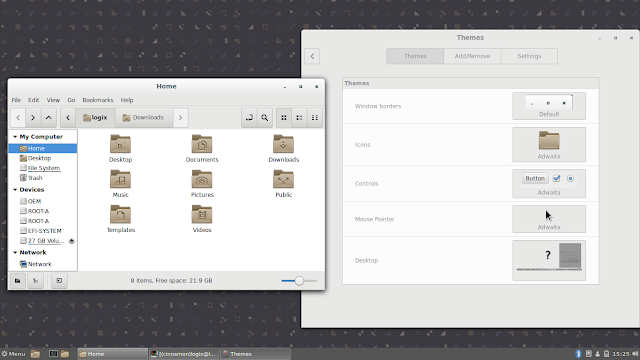 Cinnamon is pretty bare-bone when installed on a Chromebook. You get Nemo, the default Cinnamon file manager, but quite a few essential applications are missing. 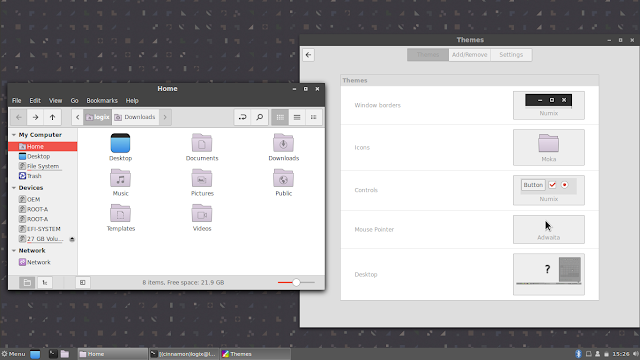 It's worth noting that Cinnamon now uses its own fork of some Gnome applications, but those are not available in the Ubuntu repositories (except Nemo file manager). If the application doesn't list applications, try to restart Cinnamon. On my Cinnamon Crouton installation, Gnome Software doesn't show any applications on its homepage, but the category pages do list applications, and the search works as well. 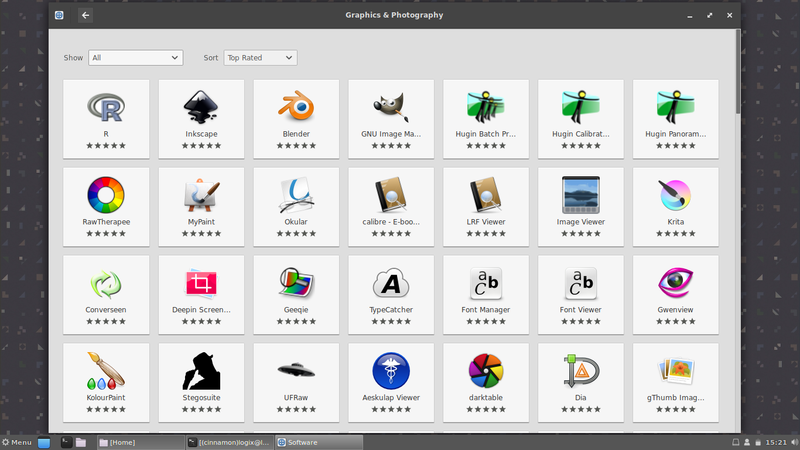 You can use Gnome Software to install "traditional" DEB packages from the Ubuntu repositories or from PPA repositories, but it can be used to install Snap or Flatpak packages. Such packages can't be currently installed if you're using Crouton. You can now use one of these themes by going to the menu > System Settings > Themes, and changing the Window borders, Controls and Icon themes.